This month’s Fortean Times #305 (a sort of ‘paranoia special’) features my exposé of the extraordinary anonymously-penned book Crook Frightfulness, self-published in 1935 by “A Victim”. In this blog post I’ll present some thoughts on the book’s semi-acoustical ideas. Crook Frightfulness was first brought to my attention by the marvel Westwyrd the Bard: drum-specialist and custodian of curiousness. For those unacquainted with the book, it’s an autobiography of a man tormented by crooks who embark on a campaign of staring, ventriloquism and covert psychological harassments against the author. The “Victim” writes of his personal hell in which everybody else is either complicit, or simply fails to notice the ventriloquist abusers who stalk him across the British colonies. Crooks are also able to hear the Victim’s thoughts by a theorised listening apparatus used with headphones (a sort of powerful stethoscope device). Some of the antiquated colonial sentiments add an extra dimension of bizarreness. 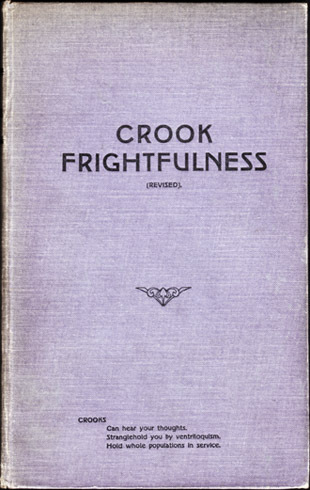 A colleague described Crook Frightfulness as an “acoustic mystery thriller” although it’s generally seen as a schizophrenic emission. For anybody interested in sound, its psychology and its perception/misperception, it’s a particularly fascinating book, as the author manages to “attain a degree of impersonal interest” (as he puts it) and proceeds to investigate the phenomena from his own practical, acoustical viewpoint. Crook Frightfulness is split into three parts. The first part – some 40 odd pages – begins almost like a potboiler; autobiographical sensationalism comparable to, say, Sydney Horler’s 1934 exposé, London’s Underworld. Part two is written more matter-of-factly, albeit disjointedly and with heightened paranoia. Here, the author writes of his experiences and travels around the colonies to outmanoeuvre the ‘crooks’. The third part is the ‘Vital Climax’ where the crooks’ terrible practices are examined (involving listening apparatuses). In FT305, it is suggested that the Victim did experience a genuine low-level persecution that left a lasting resonance. Likewise, crooks are said to “hear your thoughts – the sound travelling through the floor you are standing on (…) to perhaps that next room or adjoining house, to the crook listener”. Thoughts are heard by closely listening to sub-vocal articulation: “when you think (in 95 cases out of a hundred) you actually shape your words in your throat and mouth. When we breathe through our mouth or nose it is possible for these fiends to hear your thoughts.” The Victim’s theories evolve as Crook Frightfulness progresses. Some later editions feature paste-ins where a “sound ‘outfit’ like the BBC” is theorised. 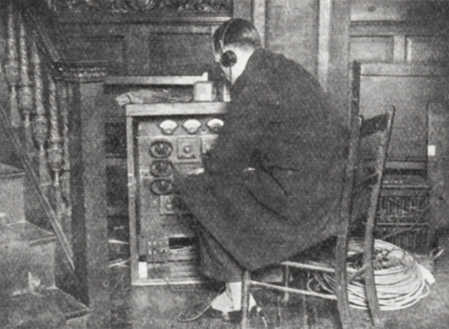 In spite of the book’s skew-whiff nature, some of these ideas were certainly at the ‘cutting edge’ – an early example of widespread covert listening is seen in the early 1940s with the hidden electric microphones around Trent Park’s prisoner-of-war compound to capture prisoners’ conversations. Last year, the writer and long-time Crook Frightfulness aficionado Phil Baker sold me a first edition of the book. Baker was also keen to know more about the book’s author. This spurred me on to compile all the scraps of information I’d collected over the years with a view to building a profile of “Victim”. The compilation of biographical facts (gleaned from both the first and expanded editions) revealed the author was born in the East End of London, in or around 1875. He was involved in rent collection and property. He left Britain for New Zealand in 1924, moved to the British West Indies around 1928, and returned to Britain to settle in Aberystwyth in March 1932. Many hours at Kew’s National Archives yielded a list of some fifty or so names, gradually whittled down as each name was followed up. The use of digital archives plays a key role in such research. 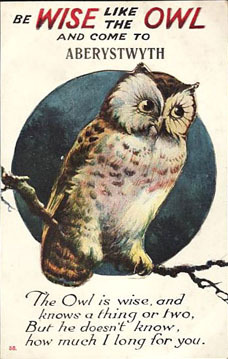 It is revealed for the first time in this month’s Fortean Times that Crook Frightfulness was written by an east London estate agent named Arthur Herbert Mills. He left Britain using the name Herbert Mills, and returned as Arthur Mills, which slightly confused matters, but further research has confirmed the connections. His story is very interesting, and only a bare outline could be condensed into the article. The book presents quite a sad predicament, but it’s hoped that the discovery of the author’s name will enable further study of the text, which charts the onset of auditory disorientation at a point in history where technology could not quite yet provide reasonable objective explanation for the phenomena. There are a surprising number of narratives very similar to Crook Frightfulness (some early examples are examined in the article). Today, people with these afflictions/assailments often cite James Lin’s 1978 textbook Microwave Auditory Effects and Applications that superficially appears to corroborate all sonic “unseen assailment” phenomena (although, in practice, such technology is very impractical). The full particulars on Crook Frightfulness can be found in Fortean Times #305. This entry was posted in acoustics, apparatus, books, Charles Wheatstone, Crook Frightfulness, deception, esoteric, Fortean Times, odd. Bookmark the permalink.